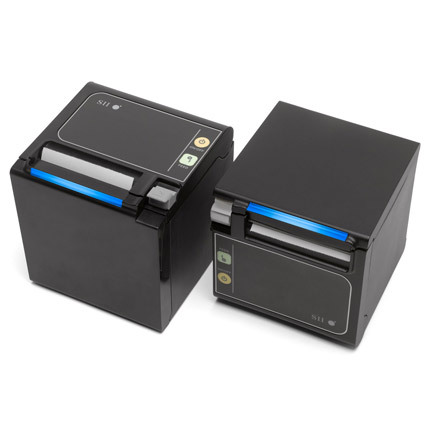 The Seiko Qaliber RP-E receipt printer is a terrific solution for retailers needing reliable, high speed printing. Available as a top or front-feeding printer, the RP-E offers versatility to make installation in any location a breeze. The RP-E is compatible with the popular ESC/POS command set, giving you compatibility with a wide variety of POS software platforms. A nearly 14" per second print speed is incredibly fast, drastically cutting the wait time on longer receipts. A space saving design, the Qaliber RP-E´s 5" cube body saves space while maximizing performance. The print head is rated for 93 miles of printed receipts, while the sharp auto-cutter provides over 2 million cuts. This reliable printer ships with a 3-year warranty, giving you greater peace of mind in any high-stakes environment. Dimension (WxDxH): 5.07" x 5.07" x 5.07"